●	Provides distinct role-plays and builds students partnering skills. 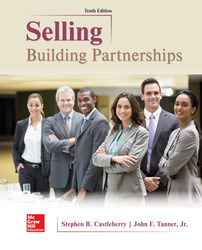 ●	Emphasizes the need for salespeople to be flexible and adapt to customers' needs. ●	Thoroughly discusses how effective selling and career growth can be achieved through planning and continual learning. ●	Reflects the global nature of selling with examples from China, Europe, and India.